"Sampath Speaking" - the thoughts of an Insurer from Thiruvallikkeni: ATM is 50 ! ~ when money flowed from hole in wall !! ATM is 50 ! ~ when money flowed from hole in wall !! Have not heard of English comedian actor - Reginald Alfred "Reg" Varney known for his television roles on The Rag Trade and On the Buses, appearing in the latter's three spin-off film versions. But this news made me know him !! In good old PSU days – salary used to be disbursed in cash on the penultimate day. The Accounts Section would become too busy with sub-staff going to bank, collecting cash – a group of people sitting together to prepare the salary cover, putting in cash of various denominations; some favoured with new notes ! [not to speak of some employees, who would prepare their own customised salary cover, showing a lower amount than what they got – to hoodwink their spouses and keep some personal money !!!!] – in those days, those who took salary by cheque used to get 3 days in advance [there was a condition that an individual should not be maintaining an account with the bank on which Office was issuing salary cheque]. Feeling that currency in hand and getting some new notes all were pleasures of yesteryears ! - gone are such small satisfactions with salary getting credited and we drawing money from ATMs devoid of smaller changes ! 27th June marked 50 years of its first appearance in UK streets and people in disbelief, talked about taking money from ‘holes in the wall’. The world’s first ATM was unveiled by Barclays at its Enfield branch in north London on 27 June 1967. As a tribute to the golden anniversary, the bank has transformed the modern-day Enfield cash machine into gold. It comes as the rapid growth in the use of contactless cards means cash will be overtaken as Britain’s most frequently-used payment method by the end of next year. ATM [Automated Teller Machine] has come a long way as an electronic telecommunications device that enables the customers of a financial institution to perform financial transactions, particularly cash withdrawal, without the need for a human cashier, clerk or bank teller. There are millions, seen in every important Street, Airports, Railway stations, some malls, theatres and more. On most modern ATMs, the customer is identified by inserting a plastic ATM card with a magnetic stripe or a plastic smart card with a chip that contains a unique card number and some security information such as an expiration date or CVVC (CVV). Authentication is provided by the customer entering a personal identification number (PIN) which must match the PIN stored in the chip on the card (if the card is so equipped) or in the issuing financial institution's database. Using the plastic card, customers can access their bank deposit and cash would literally flow down from the machine. Mr Shepherd-Barron died in 2010 at the age of 84. While he was long regarded as the father of the ATM, another Scot, James Goodfellow, can also lay claim to the title.The Paisley native unveiled his iteration of the ATM the same year at Mr Shepherd-Barron. Crucially, his was patented 12 months earlier, and was the first to use a card and PIN code system. He however, revealed he made around £10 from the patent, and has not made a penny more since. Despite the rise in other new technologies, such as online and mobile banking, the ATM remains popular 50 years on. While consumers are no longer reliant on hard cash to pay for goods, trade association Payments UK has said its forecast did not envisage the demise of money, as even in 10 years, it is still expected to make up around a fifth (21%) of all payments. 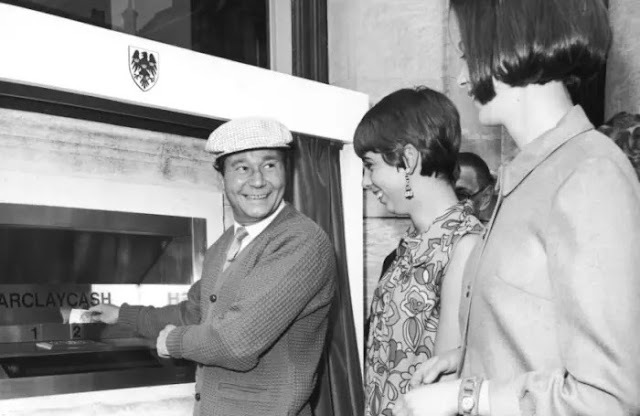 ATM’s first user was late English actor Reg Varney. Early dispensers were designed to receive hole-punched vouchers allowing withdrawals of £10 each, which could be purchased by the customer from the bank and inserted in the dispenser when needed.The mid-1980s saw the launch of the UK's cash machine network, Link. Almost every cash machine in the UK, both free-to-use and pay-to-use, is now connected to Link, allowing cardholders nationwide access to cash. In India, HSBC was the first bank to introduce the ATM concept in India way back in 1987. How many times do you use ATM every month ?